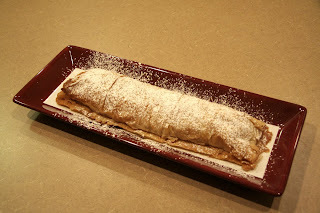 Apple Strudel may not be quite as American as Apple Pie, but it certainly tops the charts in Hungary and Vienna where it was perfected and made famous. Its origins can be traced clear back to the Greeks that first perfected the technique of making the thin dough for Baklava. They named it Phyllo which means 'leaf'. If you've never tried using the paper thin Phyllo sheets you are in for a revelatory experience. Here's where I make good the 'easier than pie' part I promised. The most perfect dough possible, flaky-thin, tender, ready-made, ready to use and found in the freezer section of most super markets. Thaw the package overnight in your refrigerator or it will thaw at room temperature in about 2 hours. 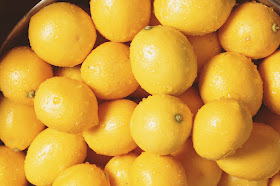 It may be stored in your refrigerator for up to 4 weeks. Most boxes of Phyllo contain two sealed packages for use with two or more recipes. This recipe takes only 6 sheets and there are usually two packages of 20 sheets in each box. A little goes a long way and it can be kept on hand in the freezer for weeks if not months. NOTE: Do not open the Phyllo dough until all of your ingredients have been assembled and you are ready to work with it. When first opened it is sufficiently moist to maintain flexibility but due to its delicate nature it begins to dry out and become brittle rather quickly when exposed to the air. It helps to cover the unused sheets with a slightly damp tea towel or sheet of plastic wrap while you are working with it. 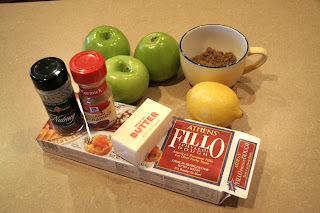 In a large mixing bowl, combine sliced apples, brown sugar, lemon juice and spices. Stir until well combined. 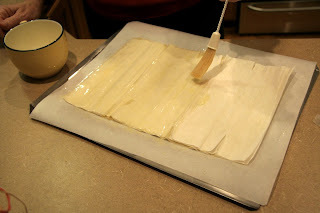 Lay 2 sheets of Phyllo dough directly on top of one another on a parchment covered baking sheet that has sides. 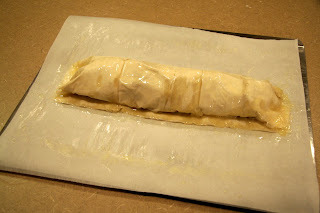 Using a pastry brush, brush the Phyllo sheet on top with 1/3 of the melted butter. Lay 2 more sheets on top and brush the top sheet again with half of the remaining melted butter. 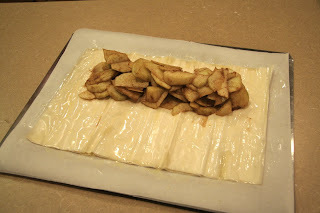 Place the final 2 sheets on top and then spread the apple mixture over half of the Phyllo, leaving a 1" border on the three sides. Starting from the long side, roll up the strudel, pressing the ends together. Place the roll, seam side down. Brush the top with the remaining melted butter. Bake until the top is golden and crisp and the apples are bubbly, approx 35 minutes. Remove from the oven and allow to cool for 5 minutes before transferring from the parchment paper to a serving platter. Sift confectioners' sugar over the top. As I always say, "You can cover up a world of sin with confectioners' sugar." After the strudel is sufficiently cool, cut into slices for serving. Serve warm or cool. It was just hubby and I tonight. Unfortunately hubby did not want to share this with me since he's planning on being pencil thin by year's end. The resident blogger is away…so that left it pretty much up to me. Let's see - I've had one serving as the official taste tester and just to let you know - it lived up to all of its campaign promises. All of them. What could be more American than that? Now. 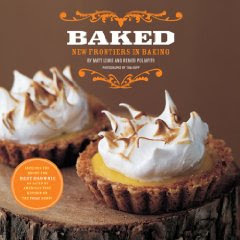 Nobody's looking, I'm the only one up and there are five servings left…well, I am the Pie Queen am I not? Photos were taken by The Pie King. Note to self: hire him as your blog photog, he's much better at that than you are. As you might imagine, the strudel was delicious. 91 calories?! T'ain't nothin'! 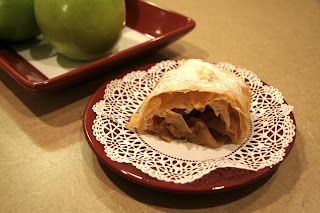 TGIP Rating--Apple Strudel--KEEPER--Note to self: bake this yourself some time. Remember how you haven't worked with Phyllo dough? That needs to be amended. Next up: I fall back on a favorite to celebrate St. Patrick's Day--Bailey's Chocolate Chip Cheesecake.